If you’re a Gleek in DC then you know the live show is coming to the Verizon Center THIS Thursday. Thanks to our friends at Chevrolet, we have a couple tickets to giveaway to our fine readers this week! All we need from you for your chance to win is a name and valid e-mail address in the comments section of this post. Comments will be closed at 4 p.m. on Tuesday and a winner will be randomly selected at that time. The winner will be notified by e-mail. The winner must respond to our e-mail by 10 p.m. on Tuesday night or they will forfeit their tickets and we will pick another winner. OMG!! I am the biggest Glee fan ever. I wear the biggest cheesiest smile on my face during the entire show – it makes me so happy! The singing in this show gives me chills ( Rachel singing funny girl and Don’t rain on my parade ZOMG). I used to be in choir in high school and college and it brings back so many wonderful memories. They were awesome in NY last year. I have tickets to a play that night but will reschedule if I win this! Pick me!! Im a Gleek!! This would be the best 22nd birthday present ever! I really hope I win! I would love love to go!! Oh we sure hope to win! I watched season one in a week and I love this show!! would love to be considered! The wife-to-be would love if I could get these. Thanks! PLEASE PLEASE PLEASE PLEASE PICK ME!!!!!!!!!!!!!!! I’VE NEVER BEEN TO A REAL CONCERT! I love GLEE more than anything. Please pick me!!!! I love Glee more than anything. Please pick me.. This is the correct email to contact me at, by the way!! I accidentally spelled it wrong in the first one. Would be honored to win these – thanks for the opportunity! ohh yeah!! that’s awesome, love the chance! This will be great mother and daughter date night!!! We both LOVE the show and the cast! Thanks for the opportunity!!! 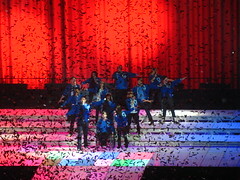 help me [see glee live], welovedc. you’re my only hope.